Welcome to Married Life: Validation? So yesterday was my 10 year high school reunion (yes, you all now know how old I am). I'm not sure what I was looking for going in, but I've been thinking about this for months, maybe even years. High school was not a pretty time for me. I guess I was hoping that things would have changed. We could all get together and be friendly. Instead I found that for the most part people were only willing to talk and hang out with their old friends and the cliques were very much still alive. I'm sure it didn't help that less than half the class was there and many of the people I hung out with on a daily basis didn't show up. Still I wonder. Why is it that I feel the need to be validated by these people who made my life so miserable 10+ years ago and that have no part in my current life? I thought I was beyond that. Once I left high school I realized that the only reason it's such a big deal is because you spend more time with your classmates than you do with anyone else. When you're graduated you begin to see how silly and isolated that little world really is. It wasn't all bad though. I did see a few people that I had wondered about and others that I just don't get to see often. Jeff (now in Florida), my good buddy Dawn (now in Spain), Chris (who I had heard nothing from or about since we graduated - now in Portland and working for Nike), me, and Brian. Was anyone else's 10 year reunion the same as mine? Chris' wife (taking the picture) mentioned that she works as an alumni director so goes to a lot of high school reunions and that as the years go on it gets better. I think things get better. 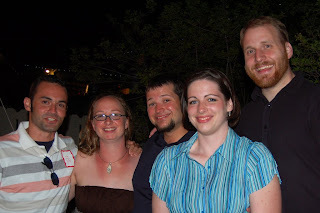 My 20 year reunion was this past weekend, which I could not attend because of family conflicts. I only had a handful of friends in high school and was not part of any popular crowd. I still live in the same town and see a few people here and there. People that were in the popular crowd. I think now we are all in the same stage of life, married and kids and have a lot more in common now. I can talk to these people now and don't have the same feelings I did in high school. I feel equal to these people instead of so inferior. I am hoping to be able to make it to the next one. I opted out of my 10-year reunion for reasons that you mentioned..I just knew it would be just like high school. The friend that tried to talk me into going called me from the reunion and said, "You were right..I can't believe how much nothing has changed!" My 20year reunion was last year. Again, didn't go. Again, got the calls from frantic friends in the ladies room looking for excuses to leave early because they were having such a horrible time! I'm sure some people have fun at reunions. I just have never met any of them! Okay, so I am coming up on 45th reunion so don't worry about the 10th .. and I have only been to one in all these years ... my 5th. We don't live very close to where I want to high school and it hasn't been a big priority for a vacation. I keep in touch with my few best friends ... but it would be fun to see the others. I bet they are all OLD!